WBA light welter titlist Jessie Vargas jumped up to welterweight last night at StubHub Center in Carson, CA but bit off more than he could chew as he was outfought by former two-weight world titlist Timothy Bradley in an exciting battle for the vacant Interim WBO crown. Bradley started with a focused body attack in the first frame until Vargas caught his shorter rival with a good shot in the second round that shook "Desert Storm" but the Las Vegas man couldn't better his work as the more experienced Bradley gained time to recover. After Bradley had worked out the timing of the punches of Vargas, he began to launch raiding tactics, nipping in to deliver salvos of shots before heading back on the outside. But Bradley was throwing wild haymakers at times and the more disciplined Vargas punished him for that, landing crisp straight punches. The middle rounds saw Bradley throwing and scoring more but Vargas continued to pick his spots and land well at times, he just was not busy enough due to having to deal with the continued forward motion of his antagonist. By the later rounds, Vargas was tiring from the fast pace of the contest and his face began to swell from all the shots he'd taken but the younger man continued to score with single punches, although Bradley was clearly in control of the fight. In the 12th and final round, Bradley was being cautious, staying away from Vargas and picking his spots but walked into a perfect right hand counter with just seconds remaining. Bradley, hurt badly by the punch, stumbled and wobbled across the ring but was together enough to lay on the ropes and block the follow up attempts by Vargas before the pair clinched. Referee Pat Russell pulled the boxers apart and signaled Vargas to stop. At that point Vargas, thinking that the bout had been halted in his favor, began to celebrate wildly. Confusion reigned as people at ringside climbed through the ropes and onto the canvas although officially, seconds still remained of the twelfth round. 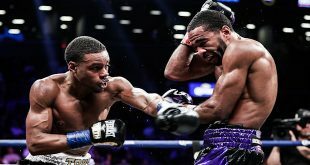 Russell quickly indicated to Boxing Commission officials that he though he had heard the bell ending the fight and was communicating that to Vargas when he waved him off. After order had been restored, the last seconds of the fight were not completed but rather scores of 117-111, 116-112 and 115-112 were announced, all in favor of Bradley, who wins the UD. Bradley moves to 32-1-1 (12) after winning his biggest fight since a controversial split decision against Juan Manuel Marquez in 2013. The 31 year old from Palm Springs could finally get the opportunity to face Floyd Mayweather Jr, who holds the full WBO welter title. The 26 year old Vargas, 26-1 (9), suffers his first loss as a professional and has reportedly demanded a rematch, maintaining that he would have KO'd Bradley had referee Russell not ended the contest prematurely. 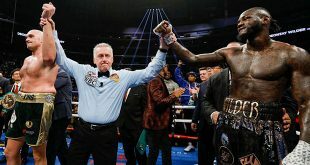 Given the controversial nature of the ending of the fight, a rematch could be mandated by the WBO but Vargas could do better by going back down the ladder a bit and face seasoned competition in order to build up his own experience before stepping up to the elite level again at welterweight. The undercard saw Mexican Olympian Oscar Valdez, 16-0 (14), continue his matriculation at super featherweight with a 99-90, 98-90, 98-90 UD over veteran Rueben Tamayo, 25-6 (17), after ten rounds of combat. 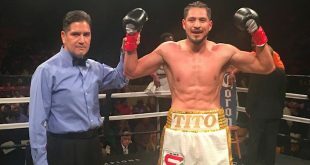 Valdez had previously KO'd all but one of his opponents but could not do the same to Tamayo, who was credited with a knockdown in the first frame when Valdez tripped and then later lost a point for low blows in the seventh round.